Earlier this year, Ryan and I went on a 2.5-week road trip through the American South, which revolved around the theme of human rights and social justice. It took us to quite a few famous landmarks and museums related to Civil War and Civil Rights Movement in Mississippi and Alabama, which appear in most any historical Southern road trip. But we actually kicked off our trip in Louisiana. In addition to the South’s history, we also wanted to explore present-day social, political, and environmental issues – and the Pelican State taught us a ton. With round-trip flights booked to New Orleans, we started and ended there. 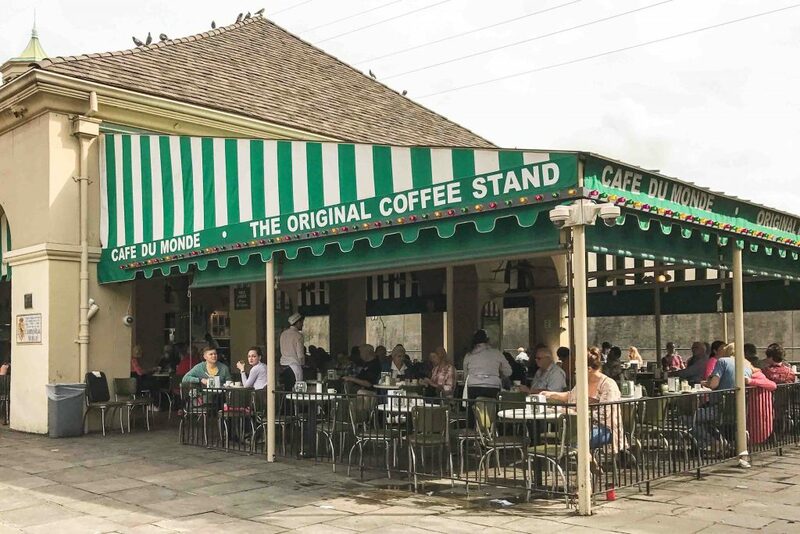 While it might not seem like it fits with the theme of the trip, our experience in New Orleans ended up being right in line with what we were looking for. 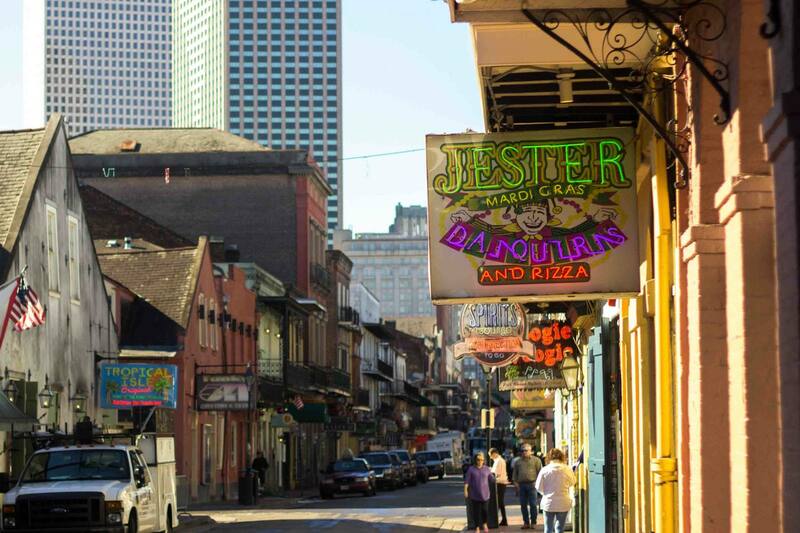 It quickly became clear that this city has so much to offer civic-minded travelers – and that there’s way more to it than Bourbon Street! A generous friend hosted us for the first few nights of our trip and taught us all about what NOLA locals do (hint: it’s not drink in the French Quarter). We immediately felt at home in her bright, airy house, and loved coming back after a day of exploring to hang out with her and her roommates. Our time in New Orleans did take us (of course) to “the Quarter,” though many have had a wilder time there. But we enjoyed taking in the famed neighborhood, laughing about the daiquiri “to-go” bars, and classing it up with drinks at the historic Sazerac Bar on our first night. We also made a point to sample the famous beignets and chicory coffee at Café du Monde. I’m not sure chicory is the flavor I want in my everyday coffee, but it was worth trying. On our first full day (after a caffeine fix at PJ’s, the local go-to coffee chain), we headed out to Whitney Plantation, one of several historic plantations in the New Orleans area. Whitney was the perfect choice for this human rights-themed trip, as it’s the only one that focuses on the history of slavery. Its exhibits illustrate the daily lives of the slaves who worked there and the hardships they faced. The plantation is heavily research-focused, and is actually staffed by academic researchers who study the history of slavery in the U.S. The information presented is based on historical documents and first-person narratives of former slaves, mostly collected through the Federal Writers’ Project, a lesser-known New Deal program. 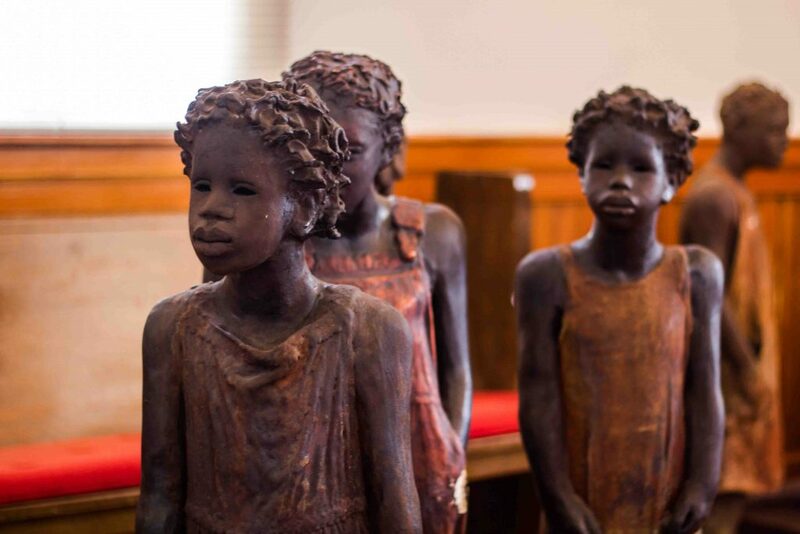 The tour starts with a short video, shown inside a restored church that is now home to statues of slave children who lived at Whitney. It takes visitors through several other buildings on the plantation, but I thought the most interesting part was seeing the slaves’ quarters, where families lived in cramped and very basic cabins. 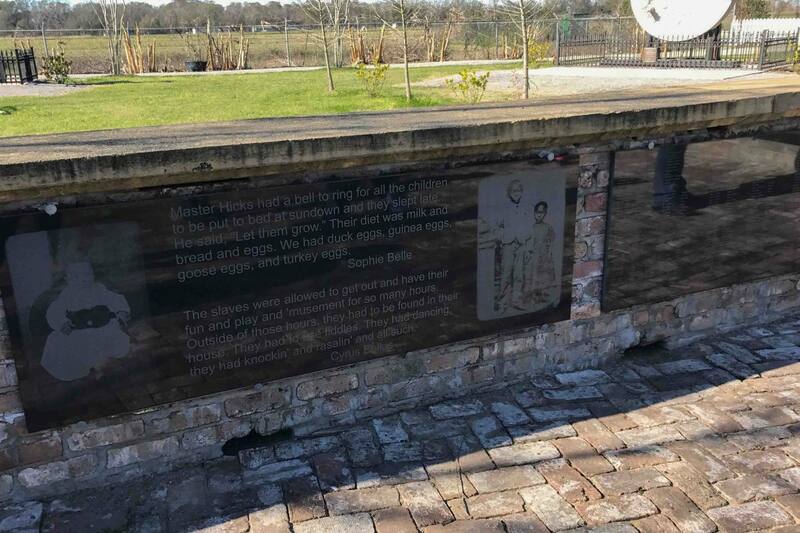 The plantation has also erected monuments listing the names of slaves and quotes from some of the narratives collected. We didn’t go to any of the other plantations, but from what I’ve heard, they mostly bypass the uncomfortable history of slavery. Visits to places like Oak Alley Plantation emphasize the lavish lives of the white plantation owners, and seeing “the big house” (the owners’ home) is their main draw. Honestly, I can’t imagine slavery is anything but a giant elephant in the room. 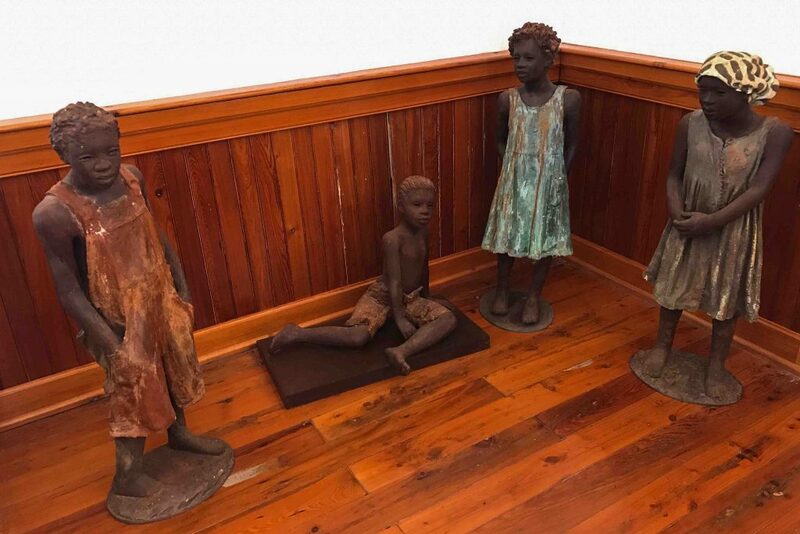 Whitney is the most recent plantation in the area to open to visitors, and it sounded like there are still plans to expand some of the exhibits. We visited on a tour that left from New Orleans, and the driver offered a lot of useful information and entertaining stories on the way there. But you could save quite a bit of money by driving there independently and taking a public tour (a tour is the only way to visit). Our second big adventure from New Orleans took us out of the city and into the swamp. Lots of companies run different types of boat tours through the swamps near New Orleans, but we knew we wanted to do a kayaking trip to get more up-close and personal and squeeze in some physical activity (plus, kayaks are more eco-friendly than motorized boats!). 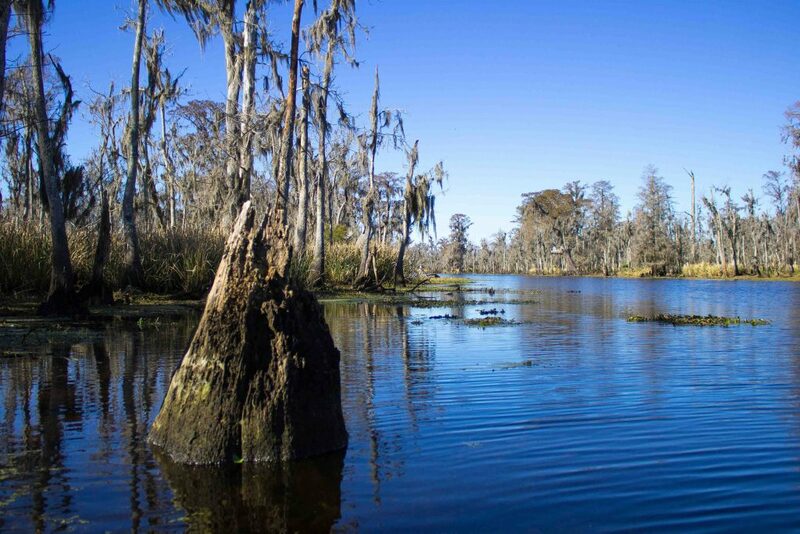 Our trip with Wild Louisiana Tours took us through the Manchac Swamp, about 30 minutes from New Orleans. Since we were the only people to sign up that day, we lucked out and got a private tour, and our guide was super friendly and informative. We’ve done lots of kayaking in the past, but the scenery on this trip was totally unique. During other times of year, the plants fill in and create a more opaque boundary on the edges of the bayou. But in January, you can see between the plants and far into the swamp; it may not be as beautiful as a lush green jungle, but it was remarkable. During the paddle, we learned all about the Native Americans who once lived in the area, the early explorers who traveled along the bayou, and the settlers who made a home there. Our guide also talked about the fragile ecology of the area, and the environmental threats to nearby towns; in southern Louisiana, land is being washed away at the rate of one football field per hour. 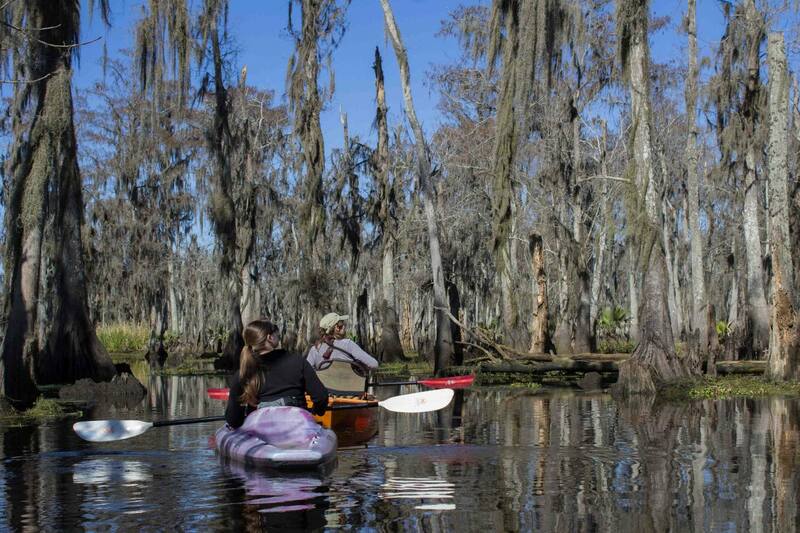 Whether you’re on a mission to learn about history and ecology or you just want to get outdoors and on the water, we highly recommend Wild Louisiana’s tour. 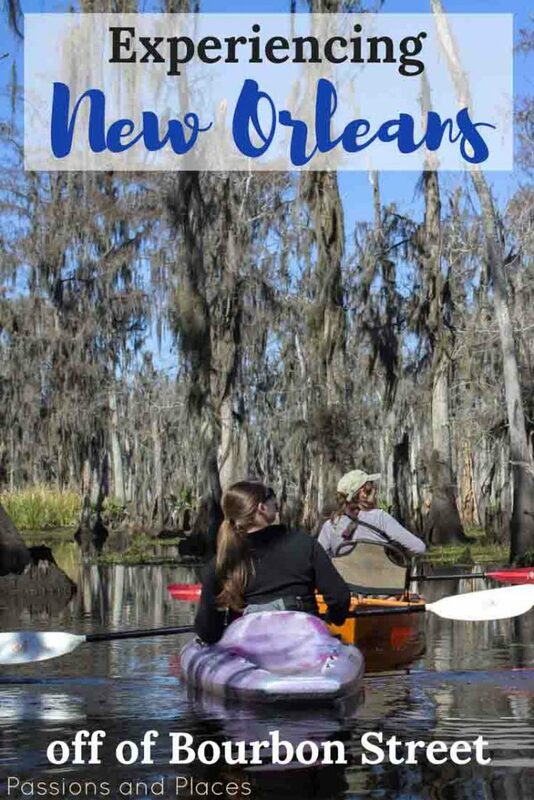 There are kayak rentals available in New Orleans, but unless you have your own car with a roof rack, it would be pretty hard to DIY a trip like this. Even then, having a guide with intimate knowledge of the area was well worth the extra cost. Rather than the devil worshipping and creepy dolls you might think of, voodoo is, at its most basic, a religion based on West African beliefs brought to the U.S. by slaves. 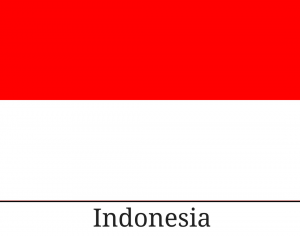 Since then, it has evolved and melded with other religions, and developed differently in different places. While voodoo practitioners do use a variety of potions, charms, and dolls, they’re not intended for evil any more than prayer is a meant to be a way for Christians to have God curse their enemies. When New Orleans was under French rule, the Code Noir governed slavery in French territories. Among many other things, it required slaves to adhere to Roman Catholicism, so they practiced their own religious rituals in secret. During the tour, the guide talked about some of the foundational voodoo beliefs: for instance, that the universe was created by one supreme deity, whom humans can interact with only through lwa, spirits akin to Catholic saints. Later in the tour, we saw the former home of Marie Laveau, the Voodoo Queen of New Orleans. She had an almost mystical hold on the city during the 1800s and is widely credited with popularizing and legitimizing voodoo as a religion. Today, an estimated two percent of New Orleans residents practice voodoo as their religion. We really enjoyed the chance to learn about the “real” voodoo and the actual people who practice it, and we would definitely have taken another one of the walking tours if we’d had time. All of these tours are tip-based or “pay what you want,” and we tipped $15 for the two of us. I’ll also mention that we visited Mardi Gras World, which presents the history and traditions of the holiday. 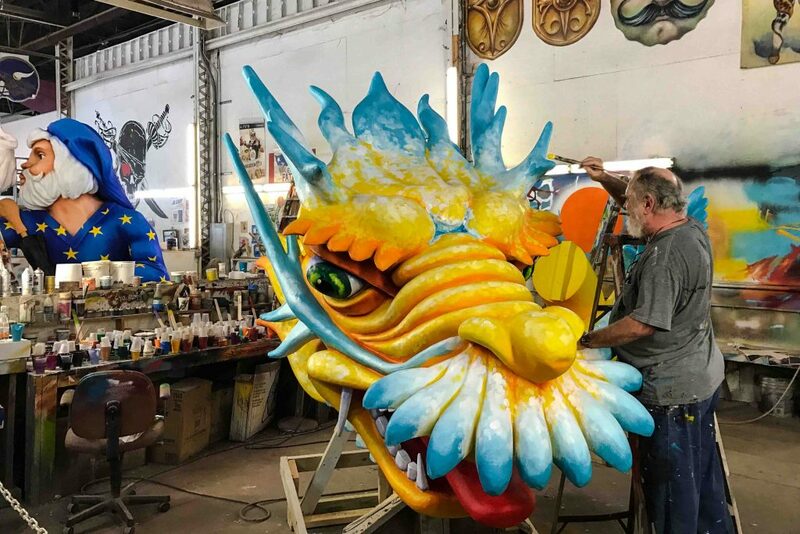 The highlight is getting to walk through the factory where the floats are created and watch the artists working on them. While it was interesting to see, it’s also pricey – $20 per person for a tour that lasts just an hour – and our guide was seriously unenthused. If you have the money to burn, it’s not a bad way to spend an hour (and maybe other guides are more entertaining than ours), but it’s definitely not my top suggestion for New Orleans. While all these activities kept us pretty busy during our few days in New Orleans, we found some time to explore a few different parts of the city. 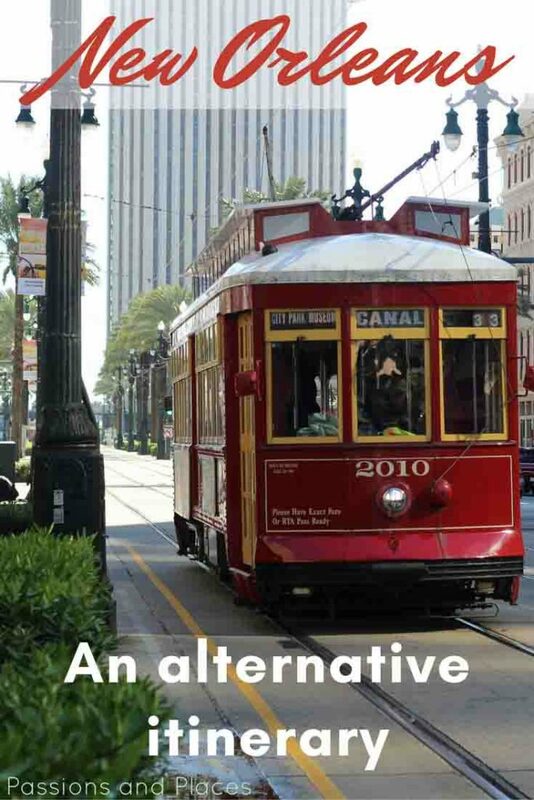 Magazine Street, St. Charles Street, and Canal Street are all ripe for wandering, and you’ll want to hop on the streetcar at some point, too. The city also has several fascinating cemeteries, where the dead are buried in elaborate above-ground crypts. 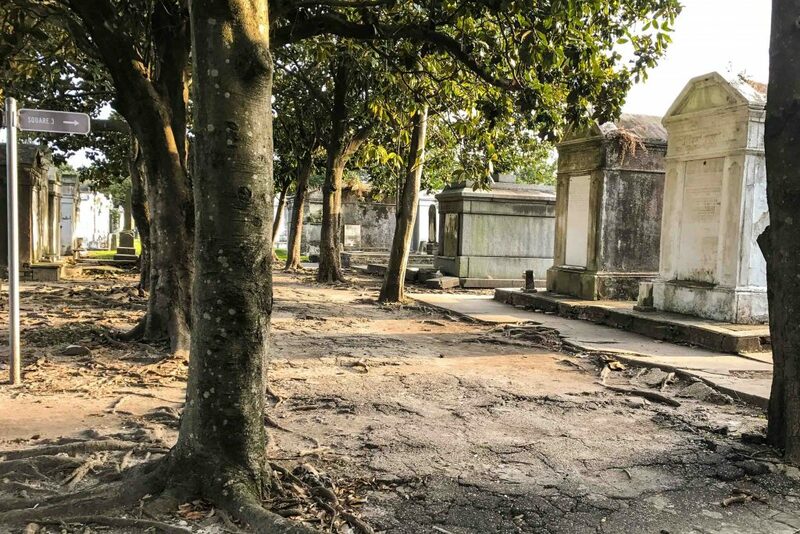 Pro-tip: you don’t have to take an expensive cemetery tour; just head to one on your own, and you can walk around. I can’t talk about New Orleans without mentioning one of the best meals Ryan or I have ever eaten: on our last night in the city, we headed to SHAYA, named the country’s Best New Restaurant last year. The entrees are delicious, but the important thing? Order hummus and other dips like labneh and baba ganoush for the table – servings of pita just keep on coming, and it’s probably the best pita you’ll ever eat. SHAYA is definitely a splurge meal, but a worthy one, and it’s not totally unaffordable. After four days, I have to say, New Orleans won me over. Maybe it was just the warmth and sunshine or the good company, but I have a feeling I’ll be back to the Big Easy sooner or later. 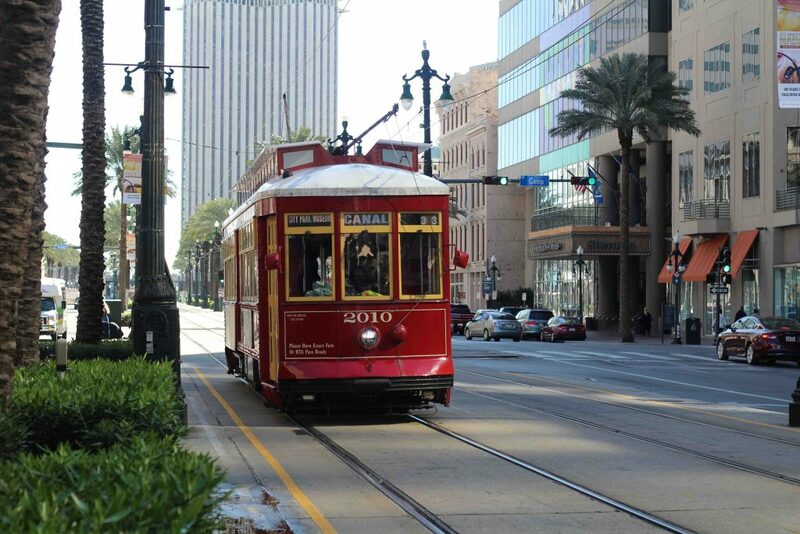 What’s the most interesting thing you’ve done in New Orleans? Of course, a few days of tours hardly makes me an expert on the complex issues around slavery, voodoo, or the environment. I did my best to present things as they were explained to me, but please correct me in the comments if I’ve gotten anything wrong! I have to agree with you, Jamie. 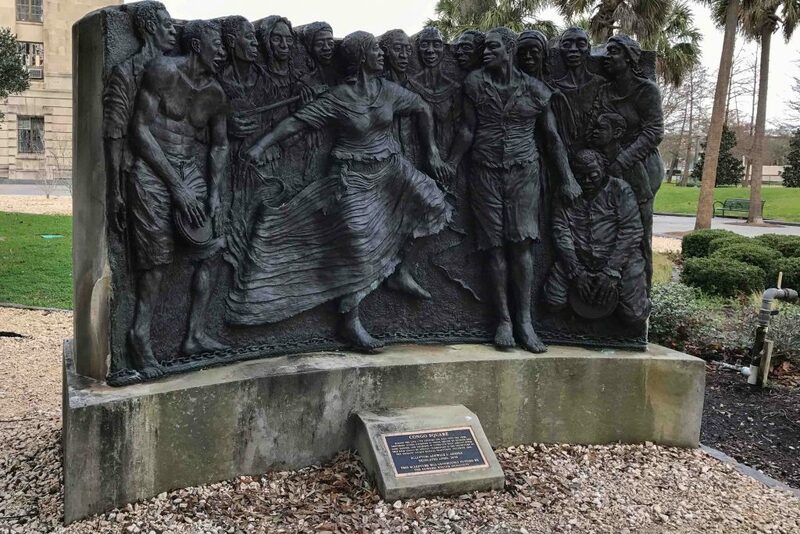 I have been to a number of the plantations and spent quite a bit of time engulfed in the culture of the south… it is very easy to look with outside eyes and judge without digging a little deeper and seeing the truth. I am not negating the evil of slavery, however, it was the culture of that time and much like other civilizations, made the impossible; possible. Revelation came and liberty graced, now we have the opportunity to look and learn. Learn and move on to a better future. I LOVE the south, it is very unique and should be treasured and the history preserved. I’m only getting to this now (catching up on all my blogs at the moment!). Thank you so much for this journey into a place I’ve never seen, but always been curious about. Almost makes me feel like I was there! Thanks so much, Sibylle – I’m glad to hear you enjoyed it! New Orleans was a really cool city, I’d been curious about it for a long time too. A lot of these things I was not able to do, I didn’t visit any historical buildings/museums. I lived in Terrytown for about 6 months with my husband in 2015. We only went into New Orleans maybe a handful of times. We went down Bourbon street maybe twice. We rode a streetcar, went to the zoo, the city garden, the aquarium, went on a ghost tour, went to Hansen’s Sno-bliz, one time before that I went to the WW11 Museum. Also, getting pictures at cemeteries is a thing. Some photographers offer photo shoots. We didn’t get the chance to go to any plantations or do any swamp tours. I would love to go back and visit/view historical places. Oak Alley Plantation had six buildings telling the story of the enslaved on that plantation. I found the exhibit to be compelling, factual, respectful, and truthful. I was told by one of the guides that the exhibit took 6 years of planning and construction, and I believe it. Some of other the visitors I spoke with were bothered that slavery was part the self-guided tour rather than part of the guided tour, and I understand. I personally found that it added an air of reverence to the exhibit, and allowed me to take my time and explore it in depth, rather than be rushed through a timed, guided tour. And the staff seemed open to answering my questions about slavery, although most of those were answered in the exhibit itself. Whitney does an amazing job of telling the story of American slavery, but that’s all they share. Oak Alley gave me the opportunity to learn about how the US Civil War, French Creole life, sugarcane farming, and slavery all intertwined to form the rich, and often painful, history of Louisiana. I can honestly recommend visiting both plantations, if you willing to visit each with an open mind, and an understanding of what their missions are. Honestly, if slavery is the only subject you are interested in, go to Whitney where they cover that in depth. If you want to learn more about the overall history of the antebellum south, good and bad, Oak Alley does that well, in my opinion. While we can agree that slavery was perhaps America’s greatest sin, and needs to be studied in depth, to ignore the rest of history just robs us of a chance to learn more. Thanks very much for taking the time to comment, Jamie! What I described is what we we told by our driver and by people who’d visited Oak Alley, but it’s very possible they only did the guided tour and maybe didn’t even realize how much more there was. We were able to learn a lot about other aspects of Southern history through other stops on this trip, so I was glad for the chance to go someplace that focused wholly on slavey and the slaves’ lived experiences. But I’m really glad to hear Oak Alley gives a more comprehensive perspective than I was giving it credit for, and thanks for sharing your experience!